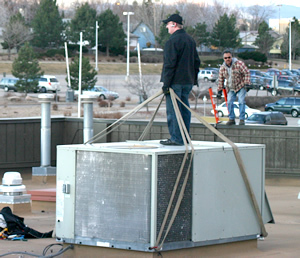 eBuilding Service has 13 years of experience servicing, maintaining, repairing and installing commercial HVAC and refrigeration units throughout metro Denver and along Colorado's Front Range from Fort Collins and Greeley to Colorado Springs. We know the business inside and out and have a staff of experienced, highly-qualified, trained HVAC subcontractors at your service. We are licensed, insured, bonded and EPA Certified mechanical subcontractors for Denver, Boulder, Parker, Northern Colorado and Colorado Springs. Among the hundreds of tenant retrofits, commercial remodel and HVAC and HVAC/R construction subcontracting jobs we've done, some recent examples include the Seasons 52 restaurant at Park Meadows, the new Converse store in the Castle Rock Outlet Shops and a new T Mobile retail store. Our expertise includes heating, ventilating air conditioning and refrigeration for retail, office, warehouse, multifamily, government buildings and restaurant properties. Our experience includes new construction and retrofits. Call us for an estimate for your job today. In addition to our HVAC construction subcontractor services, our mechanical contracting capabilities include refrigeration installation and subcontracting. Our experience includes walk-in coolers, reach-ins, walk in freezers, make tables, ice machines and all hot side restaurant appliances and equipment as well as hot-side installation requirements such as steam tables, ovens, ranges, grills, fryers, etc. We also have restaurant plumbing and drain capabilities. Please visit our Restaurant page to learn more. If you are a General Contractor looking for a mechanical subcontractor for construction HVAC subcontractor services in metro Denver, Boulder, Fort Collins/Greely, Colorado Springs or Parker, Colorado, eBuilding Services can make your life so much easier by providing expert HVAC construction subcontractor services as well as refrigeration, plumbing and restaurant equipment installation. We also use state of the art contractor communications systems so you always know exactly where we are in the progress of your HVAC job. For The Smart Choice in HVAC Subcontractors!